Sold by NW REIGN and Fulfilled by Amazon. Gift-wrap available. 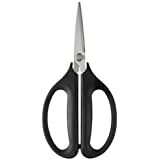 Amazon's Choice for "oxo kitchen scissors"
Sold by NW REIGN and ships from Amazon Fulfillment. 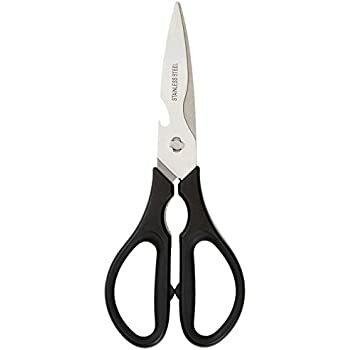 A cut above other scissors. The OXO Good Grips Kitchen & Herb Scissors are ideal for cutting cardboard, twine, flowers, meat, vegetables and so much more. 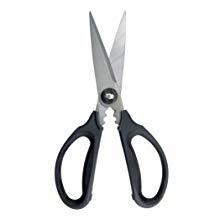 The heavy-duty construction makes them perfect for tackling a variety of tasks throughout the home. 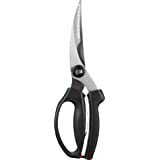 The hardened, micro-serrated blades grip items securely to prevent slipping. 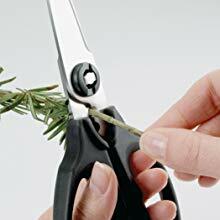 There’s a herb stripper above the handles for quickly removing fresh herbs from tough stems. 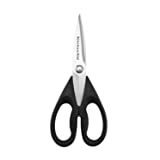 The soft, comfortable handles feature cushioned pads on the inside that absorb pressure while you cut. 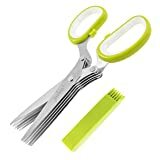 The two blades separate for easy cleaning. Needed to replace 20-year-old Henckels kitchen shears, and a 2 year-old Zyliss. 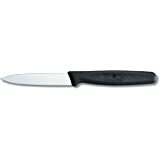 Have tried newer Henckels model, but they didn’t feel as well-made as the ones from 20 years ago. 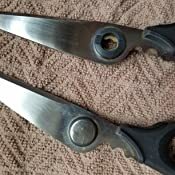 We also wanted shears that came apart for cleaning (like the Zyliss did — but the “spring action” on the Zyliss broke). 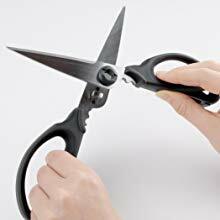 Our kitchen shears get heavy use for cutting and trimming raw meat, so we wanted a model that separated for cleaning. 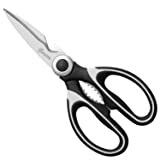 Reviews of other higher priced shears pointed out that those models separated too easily — when the user didn't intend for them to come apart (i.e., when using them to cut or when simply putting them away) and we ruled these models out. 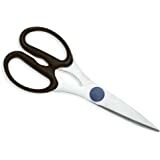 These OXO shears operate smoothly and cut cleanly — they’ve been used so far to cut up a pork roast into chunks for stew, separate pork ribs, cut up several whole chickens (at the joints, but also between the breast bone and along the backbone). 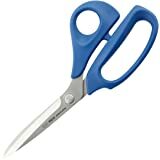 Without a spring action, it does take a bit more effort to use the shears but that minimal effort is not enough to be tiring when doing regular kitchen prep. 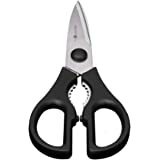 To separate the blades for cleaning, the user has to open the scissors far wider than one would normally do when cutting, so there is little chance they can separate unintentionally. But since they do come apart, they are easy to clean and disinfect. 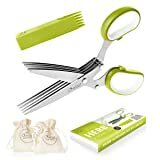 I highly recommend the OXO multi-purpose shears — they are solid, well-built and designed, comfortable for daily kitchen prep, and at a great price point. 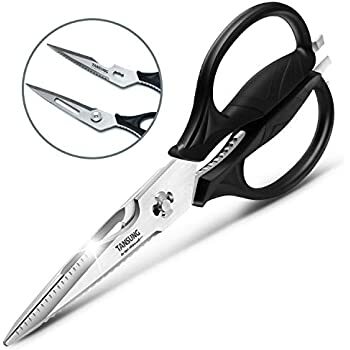 5.0 out of 5 starsTop notch, great scissors for kitchen work. 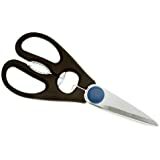 Once again, OXO comes through with a product much greater than industry standards; I love these scissors! They keep things simple, as should be. 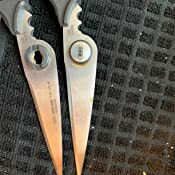 After about 15-years of service, the scissors that were included in our Zwilling/Henckle knife set gave up the ghost. 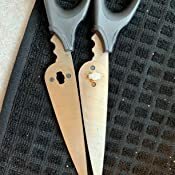 Impressed by the longevity of those scissors, we ordered a like pair of scissors only to find the quality had left, and the so-called stainless steel is now rusting junk. 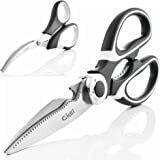 We tried another pair of "chef's" scissors, but were disappointed in that the scissors were not able to be disassembled - what a joke - not for kitchen work. 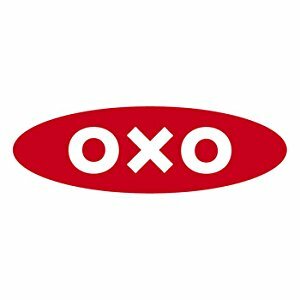 Along comes OXO. 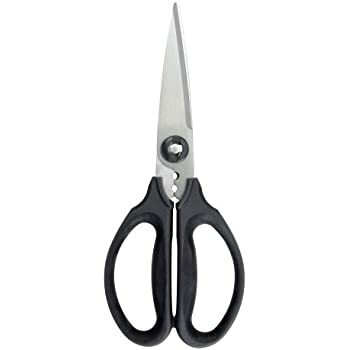 Great, sharp blades that have a tight fit against one another, so paper cuts with a great certainty. 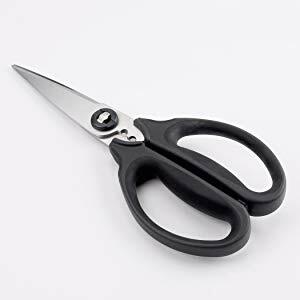 The handles on OXO scissors are fantastic! So comfortable, soft, and roomy. 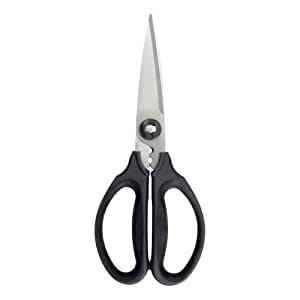 Hands down, a great pair of scissors. I bought these 2 years ago and am repurchasing now. I have no idea where they went but my guess is that my son accidentally threw them away. 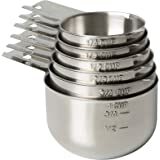 I have a pair that came with my cutlery set but they don't come apart so I only use them for dry goods, veggies, etc. 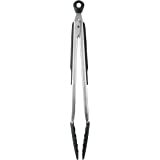 I always used these for meat packaging and meats-or anything that I feel needs to be sanitized off after use. These come apart and I just plop them into the dishwasher silverware basket. I use the dishpacks-any brand. I also use the dry function in my dishwasher so that water does not remain sitting on everything overnight. I highly recommend these-very convenient, well made and effective. I also love the herb stripper. I don't use fresh herbs very often but when I do, the scissors function very well for that. this looked and felt amazing, wanted to love this. but this rusted after one use. extremely disappointed. 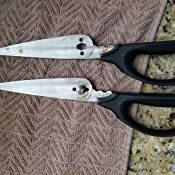 sent an email to oxo about the scissors rusted after one wash. they replied back saying they will fedex a replacement. very easy and nice about the situation. 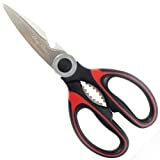 5.0 out of 5 starsTHEY CUT! 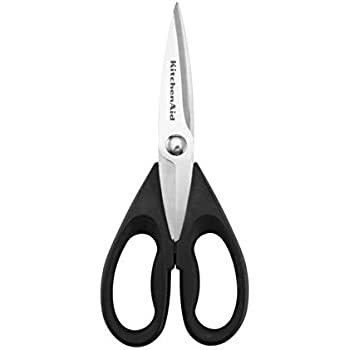 I needed a second pair of kitchen scissors. We purchased both these and the more expensive ones recommended by America's Test Kitchen. I liked these better. The other, more expensive, these are also high quality and the other (ATK's recommend) kept falling apart, while they liked that for cleaning purposes - these clean up just fine and WAY less money and even more comfortable on the hands.